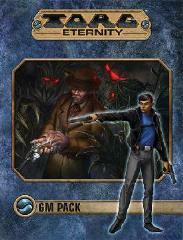 This pack contains accessories designed to enhance any Torg campaign. A double sides dry-erase map of Core Earth shows all the invasion zones across the planet and allows the adventurers find or remove stelae and change the course of their world’s war! Cosm table tents have key rules and data on them and can easily swapped out or used in combination, and Storm Knights move through zones with different properties. Sheets of counters make it easier for both heroes and villains to track Shock, Wounds and key conditions such as Stymied or Vulnerable as the battle rages. Threat blips are study tokens that match the monsters and foes encountered within the game, and are great for tactical combat or for tracking the number of foes and their conditions even without using a map.